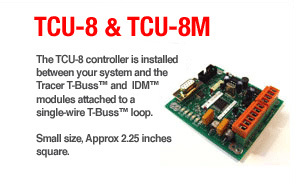 TPU-8 | Tracer Electronics, Inc.
Programs Address and other parameters into IDM™ (both the lead and SNP type) modules. Provides for full automatic test of IDM™ modules. Provides Auto program and advance to next IDM™ address. Includes Windows utility for interfacing the TPU-8 (via a serial cable) to a PC. Includes TPU-8 Programmer/Tester, 120VAC power supply (XFRMR-1), Serial cable & software utility.